We got started immediately after his class on side control finished. I began by asking about the position we’d just done in the class, as I didn’t quite get it right. 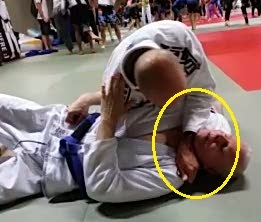 I have been playing with the breadcutter choke for a few years now, without a great deal of success. The problem I tend to have is that while I can get the grip behind the collar, I will generally then struggle to move into a submission. Instead, I’ll get the initial grip, fail to get the second grip, then vacillate over switching to something else because I don’t want to lose position. I know three or four follow ups (i.e., these), but rarely go for them because they don’t feel tight enough. Kenny had plenty of good advice. To begin, getting that initial grip can sometimes be tricky, as your arm gets stuck and you can’t reach far enough under their arm. Therefore you want to make enough space. With your cross facing arm, grip their far shoulder/gi material. Use that as an anchor point to lever them up with your arm. It’s then easy to reach through under their near arm, securing that near grip on the back of their collar. Once you have that in, it’s important to wedge the knee nearest their hips underneath them slightly. That will prevent them putting their back flat, which would take away the space you need for the collar grip. Normally this point is where I have trouble getting my second grip in. In Kenny’s version, you already have it in place: rather than trying to insert your arm over their neck, you loop your arm around that far shoulder grip you secured earlier. If they are blocking your shoulder grip by grabbing that arm, grab them back, gripping their tricep or elbow. Pull that across, so you can trap it underneath your chest. Once you’ve trapped it under your chest, bring your arm (the same one you just used to pull their arm across) under their head, like you were cross facing. You still have your original grip on the back of the collar. Grip on their shoulder, driving through them for the choke. If that doesn’t work, stretch out your leg nearest their head and drop your same side hip. Shifting to the lapel, Kenny then went through his take on the gi tail baseball bat choke, something I first encountered on Roy Dean’s excellent Purple Belt Requirements. Pull out their far lapel, feeding that under their head to your cross facing hand. Secure the grip, then cut in your original hand, gripping on top of your other first, elbow angled in (aim to put it in the crook of your other elbow). Put your knee on their belly to stop them escaping, then apply the choke. Your original arm stays fairly static, that’s mainly there as a wedge for pressure. If you need more leverage, you can try rotating around to a north south type position, putting your head on their chest. You also have the armbar as an option from there. Move your original grip from under their head to pull up on their near arm. Step over their head, drop back and finish. If you have trouble with their turning into you, grip under their leg, securing their thigh. Wrapping that far lapel over their arm works well too, especially as they’ll often try to block you feeding it by their neck. As a side note, keep your head turned towards their legs on top in side control when they are framing into your neck. That way, they can’t generate as much pressure into your throat with their forearm. Anyway, this is where the Americana comes in, same way I teach it (except that as before, Kenny likes to go to a low knee on belly for control). I find that I try many of my favourite attacks in half guard in side control as well, so half guard gi tail attacks is what I asked about next. First thing Kenny pointed out was that you need to get the knee of your trapped leg out, in order to have the necessary mobility. He started with the gi tail ezequiel I like from there, along with the choke where you wrap the tail around, then cut in the elbow. If they try to block your shoulder grip, as with the breadcutter, pull their arm across, cross-face and go for the pressure choke. This time, Kenny pulled on the sleeve and folded himself over the arm. Other than that, it was the same motion as before, just with your leg trapped in half guard. As ever with top half guard, you should also always keep in mind that the pass is an option too (he ran through his take on the hip switch pass as a result).